1968 Meet with Peter Brook, recommended by Jean-Louis Barrault. First work on an experimental staging of The Tempest by William Shakespeare, adapted by Peter Brook, Round House, London, England. 1970 Joins the International Center for Theater Research, C.I.R.T., directed by Peter Brook. 1972 Stayed in Africa with Peter Brook. Publication of Conference of birds, the story of Peter Brook in Africa, by John Heilfern, Methuen Drama Editions. 1973 Conference of birds (first version), directed by Peter Brook, Brooklin Academy of Music (B.A.M. ), New York, U.S.A.
1975 The IKS, after the book of Colin Turnbull, directed by Peter Brook, Théâtre des Bouffes du Nord, Paris, France and world tour. 1979 Conference of birds (second version). The Bone, adapted by Jean-Claude Carrière, directed by Peter Brook, Festival d’Avignon, France and world tour. 1985 Mahabharata, adapted by Jean-Claude Carrière, directed by Peter Brook, Festival d’Avignon, France and world tour. 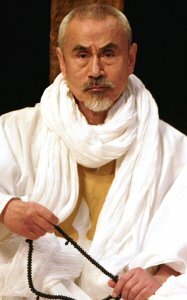 1990 The Tempest, by William Shakespeare, in a translation by Jean-Claude Carrière, directed by Peter Brook, Festival d’Avignon, France and world tour. 1993 The Man Who, after the work by Olivier Sachs : The Man Who Mistook his Wife for a Hat, directed by Peter Brook, Théâtre des Bouffes du Nord, France, and world tour. 2003 Il n’y a plus de firmament, by Joseph Nadj, Théâtre Vidy, Lausanne, Switzerland and european tour.